A recent acquisition of mine. 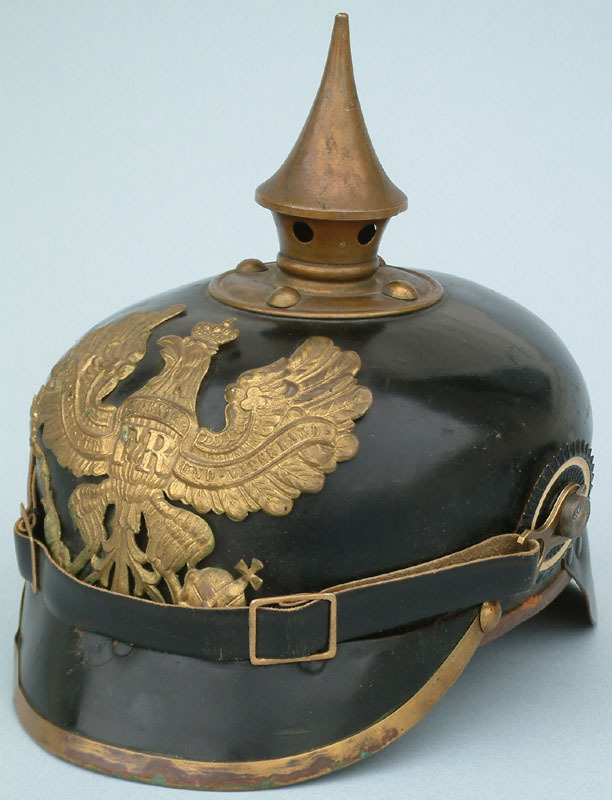 An enlisted man pickelhaube all vulcan-fiber made with riveted parts as they should be: 7 at the back and 3 at the front. The front plate is attached by two leather prongs, through two holes drilled into the main body. No grommets around them but I don’t think those hemlets were supposed to have them anyway. The plate is one of those slightly larger ones, rather crudely stamped. Please note the not-so well detailed sceptre and cross at the top of the eagle’s crown. I can't wait to see the photos of this helmet. I have created a link using John’s suggestion. The link is to a photo download site, like photobucket, except it works. You can hit a button next to your photo in the site and add the photo directly to your post. OUTSTANDING helmet! Wonderful condition for one of those. It just doesn't get better than that. Several years ago, before the internet, I passed on one of those helmets because I thought it was fake. We didn't always have a resource like Pickelhaubes.com. Does it look like this example? I see it now, got the link to work. Textbook Ersatz fibre. Very difficult to find. That is a lovely example, Tony. Do we know of there were several mafuacturers of those kind of ersatz helmets? I have found it difficult to find clear resources of this subject. From what I have been able to identify, browsing the net and going through some litterature, not all remaining examples are alike. If the construction is similar from one example to the other, some details may differ. Just for future records... and thank you to the administarors for fixing the issue with the photos.